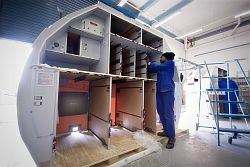 Twenty-four small, medium and micro enterprises (SMMEs), three aerospace initiatives funded by the Department of Trade and Industry (the dti), and eight universities will have the opportunity to exhibit on the pavilion of the Aerospace Industry Support Initiative (AISI) at the Africa Aerospace and Defence Expo. AISI is fully funded by the dti to support the local South African aeronautical and space industry. It is managed by the CSIR. AISI has been a regular exhibitor at AAD since 2006, thereby offering many SMMEs a singular opportunity to showcase their aerospace industry capabilities over the years. This is in line with AISI’s express commitment to support the South African aerospace industry and promote it in the global market place. This year AISI has joined forces with the National Aerospace Centre (NAC), a mechanism funded by the dti to support human capital development through bursaries and scholarships as well as focused research and development to underpin the local South African aeronautical and space industries. Eight South African universities from three provinces will be exhibiting on the AISI pavilion. The Centurion Aerospace Village, an initiative of the dti, will also be present on the AISI pavilion. The CAV aims to develop a high-tech advanced manufacturing, aero-mechanical and defence cluster adjacent to the Waterkloof Air Force base in Centurion, Tshwane. Its primary purpose is to develop a sub-tier supply chain to integrate the local aerospace and defence companies into the global supply chains, thereby becoming suppliers of choice to original equipment manufacturers such as Boeing, Airbus, Spirit Aviation and Labinal. AAD takes place from 19-23 September 2012 at the Airforce Base Waterkloof, Centurion.